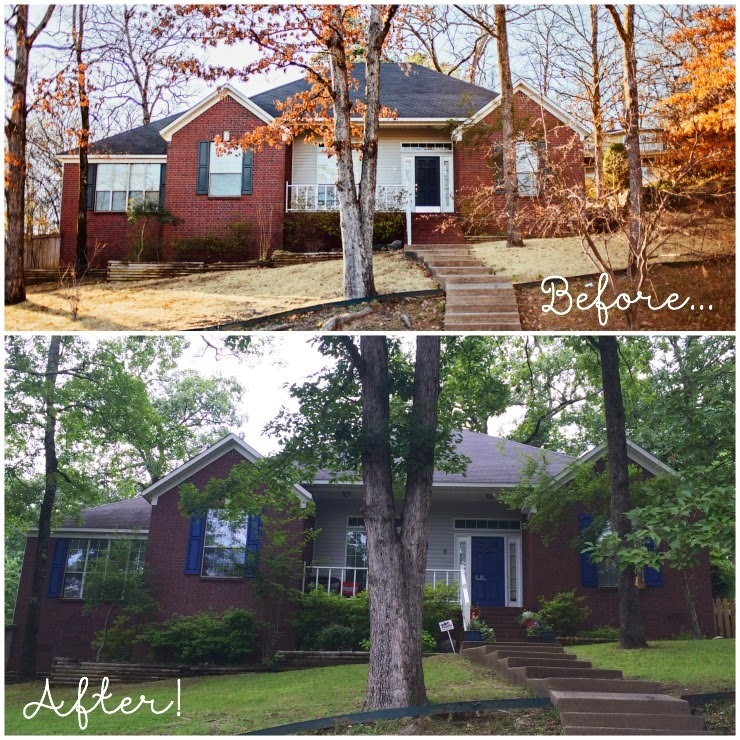 When we bought #FlorkenFirstHome in February of 2014, we knew that we had a lot of work to do. It would start by tearing down the wall between the kitchen and the living area and where it would end was a complete mystery to us. 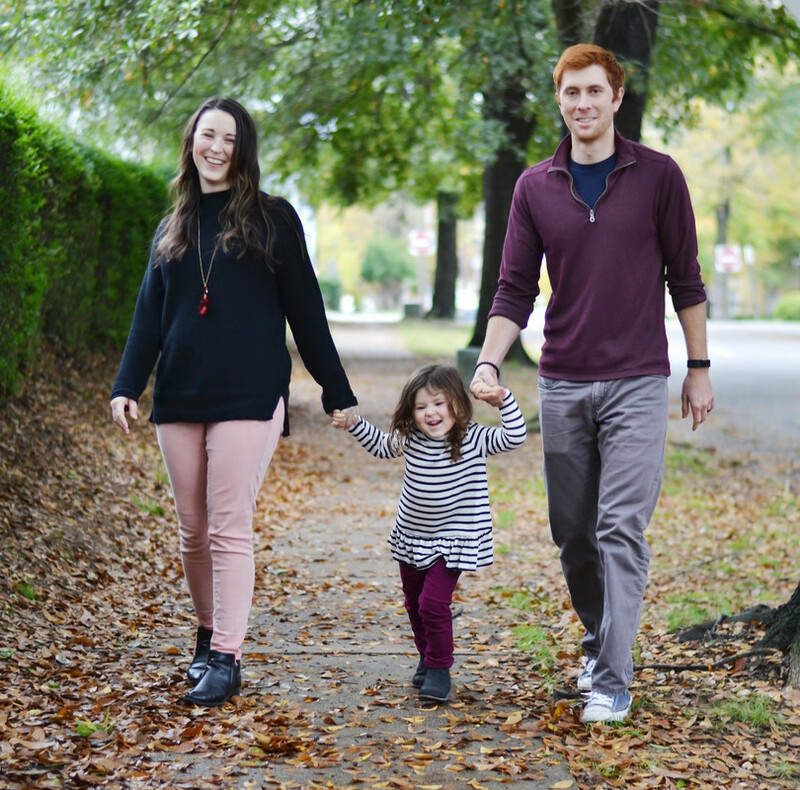 We vowed to tear off more than we could chew and to always do projects in moderation. This method, while much slower, would overall help us stay on budget and prevent us from becoming overwhelmed by household projects. That said, I still get pretty giddy when we finally finish something that I envisioned doing from the start. It is like seeing another small piece of "the plan" fall into place. Over the past month, Adam and I have been working hard on one such project and I'm thrilled to share it with you today. We finally got around to cleaning and repainting our front door and all the shutters on our home! The final product: I'm in love! I absolutely love the final result and honestly, the project wasn't as hard as I had feared. So, here's how we did it. 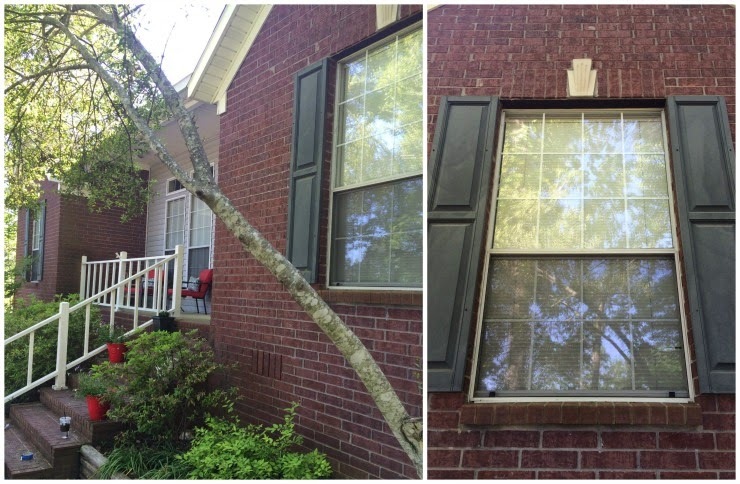 First up -- we worked on the shutters. (I'll share the front door in another post later this week!) We had to buy a rather tall ladder to get them all down. Trust me when I say that screws that have been in brick for over 20 years do not like to easily come out. It took some muscle to get the job done. In other words, I took down one set and then begged Adam to come to the other two so I could rest! Here's a reminder of what the shutters looked like before painting. Once the shutters were down, some simple cleanup was needed before we could paint. Luckily, our shutters are vinyl and all that was required is a little elbow grease and some soap and water. No harsh chemicals required! However, before tackling them with my hands, I used a broom to sweep out a majority of the junk and then the water-hose to give them a brief rinse. These things hadn't been cleaned since they went up on the house over 20 years ago! We found all kind of crap on the backside including creepy-crawlies and even a wasp nest or two. So, be careful cleaning guys. A sampling of what we found behind our shutters. Looks fun right? Once the shutters were off and cleaned, it was time to pick the color. For the longest time, I've been obsessing over beautiful blue doors and shutters on Pinterest. It only seemed natural then, that I would search for the perfect shade of blue to compliment our house. A quick trip to Home Depot and I lucked out... 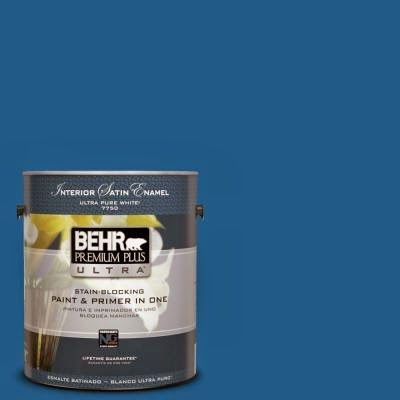 I brought home a gallon of Behr's "Blueberry Twist" in a Satin finish. I also opted for the paint and primer in one to cut down on the coats I'd need overall. 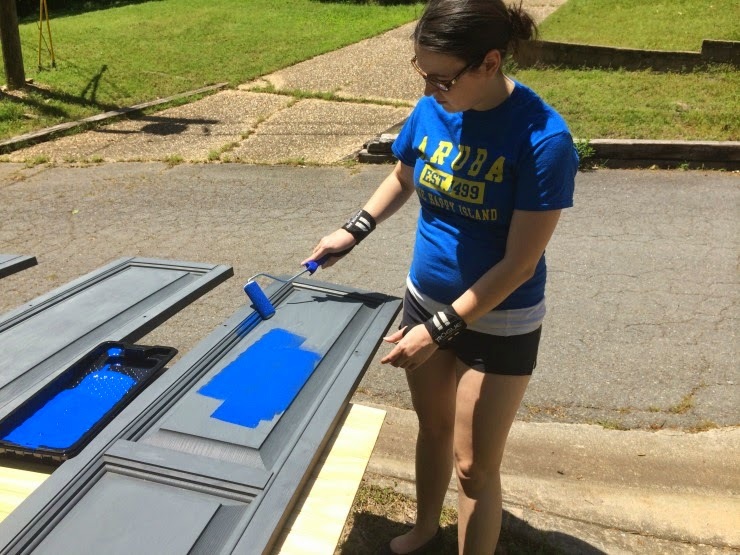 After picking my color, I simply laid all the shutters out and got busy. It really wasn't too hard. I used a small foam roller for all the flat surfaces and an angled brush for all the inset parts. Keep in mind that to properly use an angled brush, you have to rotate it to suit the angle you are painting. If your brush never moves in your hand you are using it wrong. The angle should make it easier for you... not harder. This is me demonstrating precisely where NOT to use the foam roller. The bit I'm painting here should be painted using the angled brush. Trust me -- it's easier that way! Obviously, we still have a lot of landscaping work to do our #FlorkenFirstHome but I seriously cannot stop driving by the front of the house and just staring! I love it all so much. Tell me -- do you dig the Blueberry Twist as much as I do? I can't wait to share our front door makeover later this week. 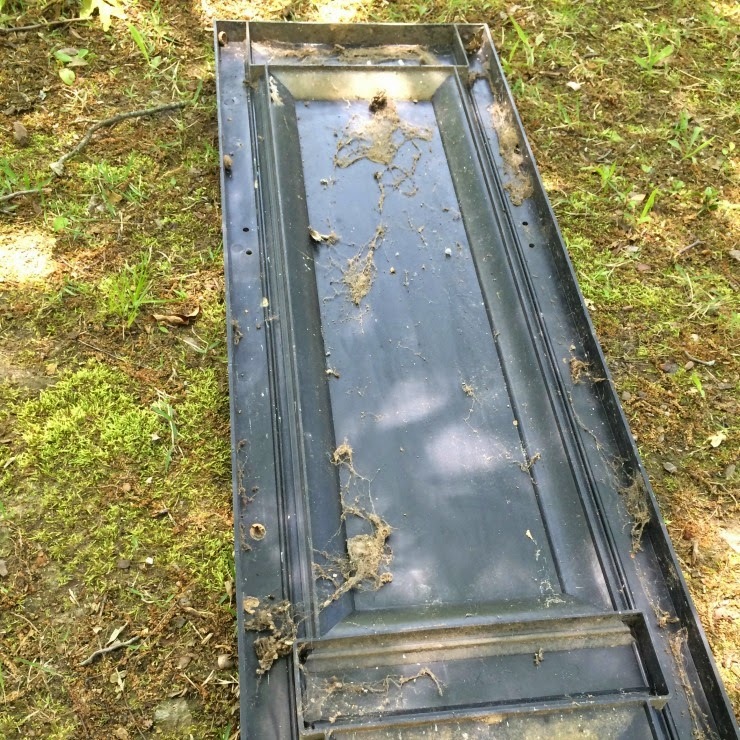 Be sure to check back for more on that... including how to remove an old brass kick plate and restore the metal door! Holy gorgeous. Seriously the blue just makes my heart smile. And honest fact: the only reason we looked at our house was because it had a fire engine red front door. THE ONLY REASON. The Blue looks so lovely and happy! Love it! Love it! Love the shutter on window look too. Perfection! I love the blue! It's amazing how refreshed just a change in shutter color can make your house look! turned out so great! it's amazing what a little paint can do. i really want to paint our shutters and door soon too. hopefully ha. I love it! Looks great. I'm very impressed with you both for it! I love it!! That blue is the accent color in the living room. I love the pop of colour it looks so beautiful on the home!! I just love what you've done with the door and shutters - Blueberry Twist rocks! I am getting ready to paint my house dark gray/ white trim / Blueberry door. Now my question to you is if you hadn't painted the shutters the same as the door - what would you choose to go along with the color scheme? I have a stone facade and I fear the Blueberry would be too much for the shutters..thoughts?